Diego Oliveira scored twice in the opening half, while Kensuke Nagai netted his 50th J-League first-division goal, as FC Tokyo showed their class with a 3-1 dismantling of Kashima Antlers on Sunday. The victory at Ajinomoto Stadium continues an impressive start to the season for Kenta Hasegawa's side, who remain unbeaten in second place after seven league games. FC Tokyo spent less than half as much time in possession as the visiting Asian club champions but made the most of their chances as they hit quickly on the break. Oliveira extended his scoring streak to three straight league games, while 17-year-old star Takefusa Kubo helped set up both of the Brazilian forward's goals in another polished performance. Hitoshi Sogahata replaced the injured Kwoun Sun Tae in goal for Antlers, as manager Go Oiwa made several changes to the side that beat South Korea's Gyeongnam FC 3-2 on the road Tuesday in the Asian Champions League. The custodian was beaten after just five minutes when Nagai headed in from close range off a cross from left-back Ryoya Ogawa. 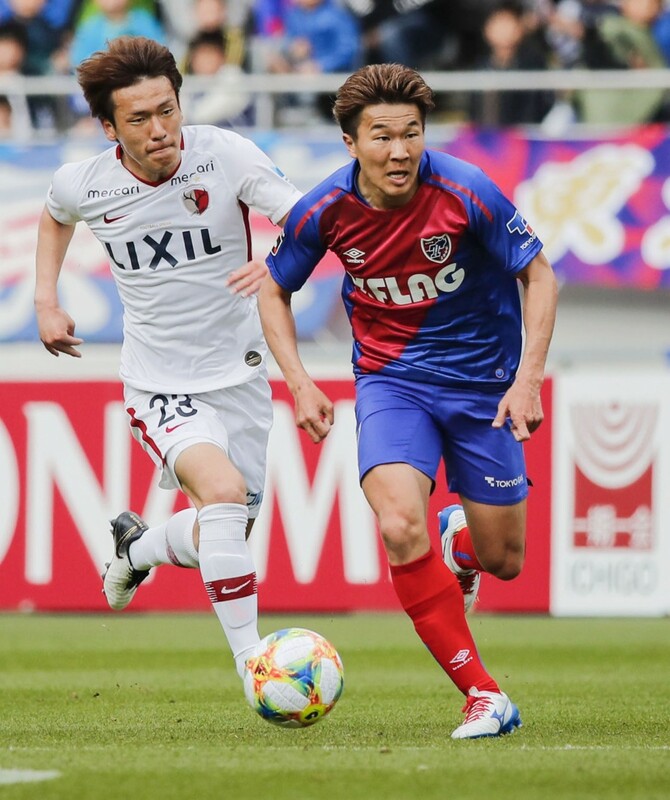 An earlier attack down the right culminated with FC Tokyo midfielder Keigo Higashi heading wide, but Yojiro Takahagi chased down the ball to keep possession and allow Ogawa to set up Nagai from the left. "It was great to be able to score my 50th goal in a win in front of home fans," said 30-year-old Nagai, who netted the bulk of his tally with previous club Nagoya Grampus. "We came out in the first half looking to score as our manager planned," he said. "For us to produce those goals, with everyone on the team involved, is a really good feeling," he added. Oliveira doubled the lead after Kubo sparked a counterattack with a high ball to Nagai. As Kashima's defense backpedaled, Nagai picked out Oliveira, who cut back inside and beat Sogahata from the top corner of the box. Oliveira brought up his brace with another superb breakaway goal, dribbling past one defender and outrunning another two before beating Sogahata for a second time. Kubo got the assist after winning the ball near his own area, then jabbing an aerial pass that fell fortuitously for Oliveira. Antlers missed a chance to pull a goal back late in the first half when Koki Anzai sent a cross that both Sho Ito and Serginho were unable to turn in from close range. The visitors hit back with a highlight-reel goal of their own early in the second half when Leo Silva found the net from 30 meters out. The loss was Antlers' second in the league this season, after a 2-1 opening-day defeat to promoted Oita Trinita. Trinita continue to impress in their first top-flight season since 2013, beating visiting Vegalta Sendai 2-0 to climb into the top three. In other first-division results Sunday, Hiroshima held onto top spot with a 4-2 win at Vissel Kobe after Daiki Watari struck back-to-back goals late in the match. Two-time defending champions Kawasaki Frontale continued to pick up steam, extending their unbeaten run in the league to three games with a 1-0 win over struggling Sagan Tosu. Chong Tese and Koya Kitagawa struck either side of halftime at Shizuoka Stadium Ecopa as visiting Shimizu S-Pulse beat Jubilo Iwata 2-1. Brazilian midfielder Ewerton hit the winner with three minutes left as Urawa Reds beat Gamba Osaka 1-0 on the road. Leandro Pereira struck a late equalizer as promoted Matsumoto Yamaga snatched a 1-1 draw away to Shonan Bellmare.